There’s a phrase being thrown around a lot these days: “Abolish ICE.” It’s a hashtag, it’s used in political speeches and demonstrations, and it appears all over Facebook. ICE stands for Immigration and Customs Enforcement, the federal agency that enforces immigration laws within the U.S. The calls to abolish ICE are not new. Advocates for immigrants’ rights, many of them immigrants, have demanded ICE be dismantled since at least 2003. They see it as a repressive agency that violates civil rights and targets working-class immigrants of color. Some advocates argue that ICE be replaced by a less draconian enforcement agency. However, radical activists argue that ICE must be completely eliminated and believe it’s a realistic goal. As my scholarship on immigration and imprisonment emphasizes, people directly affected by immigration policies have critical insights into their injustices, like indefinite detention, and how to resolve them. ICE regularly separates families and disrupts communities. Its agents raid immigrant workplaces and homes and remove deportable immigrants. ICE’s defenders argue that its agents are just enforcing the law. Immigrant organizers highlight how U.S. laws and policies have increasingly criminalized migrants. Being undocumented is a civil, not a criminal, violation. However, undocumented persons are arrested and detained. Even documented immigrants who commit minor crimes, like shoplifting, are punished through detention and deportation. For these reasons, immigrant rights activists want Congress to defund the agency and pass legislation to dismantle it. This includes members of the national advocacy organization Mijente and the Chicago-based Organized Communities Against Deportation. Many organizers link the treatment of immigrants as criminals to the government’s treatment of other communities. As they see it, immigrants, people of color, working class people and others suffer under policies like the war on drugs, waged between policing agencies and working class communities of color. The war on drugs massively invested in militarized policing and increased punishments for drug-related crimes. Another example is broken windows policing, whose zero tolerance approach has made minor infractions, like loitering, into punishable crimes. Such policies disrupt communities left behind by private and public abandonment and contribute to the highest incarceration rate in the world. Many activists and scholars, like Alex Vitale, identify the problem not as excessive policing, but policing itself. To them, policing fundamentally works to manage social inequality by suppressing workers and people of color. That is why abolish ICE echoes the chant, “Abolish the Police” at, for example, Black Lives Matter protests. 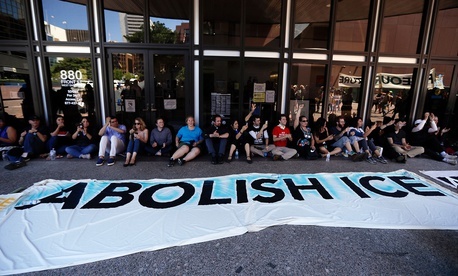 In this way, abolishing ICE shares its vision with the current movement advocating prison abolition. Abolitionists seek to replace policing and prisons with a new society that relies on neither police nor prisons to ensure community health and safety. Their efforts include, for example, stopping new prisons from being built. They also work to release people who they argue don’t belong in prison, and decriminalize behaviors that they say unfairly land people in prison, like unauthorized street vending. Abolition advocates want resources redirected from policing and prisons to community-centered institutions like health care, housing and education. Many abolitionists, like Mariame Kaba, refuse to limit their vision to what is feasible. They instead believe that social change first requires a bold vision. Along the way, constant organizing builds mass consciousness and works to reduce, for example, state violence. The fact that local governments are canceling deals with ICE to detain migrants suggests to them that eliminating a relatively young agency is a winnable goal. In calling to end the agency, advocates highlight what they say are ICE’s racist origins and abuses of power. Immigrant organizers like Tania Unzueta point to ICE’s origins in a post-9/11 panic motivated, in part, by anti-Muslim and anti-Arab sentiment. This shift flagged immigration as a national security problem and immigrants as threats to the nation. At the same time, the call to abolish ICE goes beyond the agency itself. It requires a thorough rethinking of immigration law and policy. It is at this point that skeptics and detractors question the movement. This abolitionist vision requires the repeal of laws and policies that treat migration as a crime. For example, the 1996 Illegal Immigration Reform and Immigrant Responsibility Act hardened punishments for immigration infractions. It increased the number and criminal penalties for immigration-related offenses and created expedited deportations that have few due process rights. In 2005, the Department of Homeland Security launched “Operation Streamline,” which moved the prosecution of unauthorized crossings of the southern border from civil courts to mass trials in criminal courts. Critics argue this deprives migrants of due process. Abolishing ICE, advocates say, also requires ending immigrant detention entirely. This includes detaining immigrants in military camps, local jails, federal prisons and for-profit immigrant detention centers. It means transforming U.S. Customs and Border Protection from a policing agency into “a humanitarian force that rescues migrants,” as Mijente’s policy platform states. “Abolish ICE” is no mere campaign slogan. It is a goal focused on dismantling a single young agency. I believe that, in its historical context, “Abolish ICE” is part of a larger vision to build a new a social order committed to the liberation of all.